As football ushered in its newest season this weekend, fans couldn’t stop talking about Houston Texans’ Arian Foster . 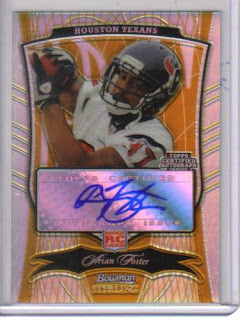 Foster signed with the Texans as an undrafted free agent in 2009 and started just one game last season. Yesterday, everyone learned his name. Foster ran for 231 yards and three touchdowns on 33 carries as he the second-year player helped the Texans defeat the Indianapolis Colts 34-24 with the second-best, opening-day performance in NFL history. The only better opening day was O.J. Simpson’s 250 in 1973. This was just the second time the Texans had ever beat the Colts. His football cards exploded on eBay after his performance with over 200 cards listed since the game. My Arian Foster Auto is still at 99 cents. I put the card on my watch list. I want to see how it ends. Foster was the man yesterday. That was a great game to watch.